Given these rates, my analysis shows that only the cheapest plan ("Lite") and the most expensive plan ("Unlimited") are worth considering. Opt for the "Unlimited" plan if your monthly usage exceeds 3GB. The best choice for most users, however, is the cheapest package, the "Lite", for the affordable Nu. 149/month. The other two plans, the "Easy" and the "Supreme", have no benefit over the "Lite" plan. In fact, you might be worse off if you select them. The reason: if you exceed the monthly limit, your post-paid payment will be more or less the same as the Lite. But if you use less data than the monthly limit, you essentially throw away money - up to Nu. 650 per month. 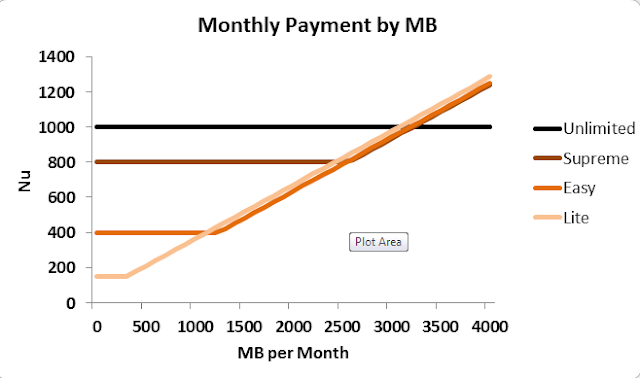 The following graph show the price you'll pay with each plan, given the monthly usage.